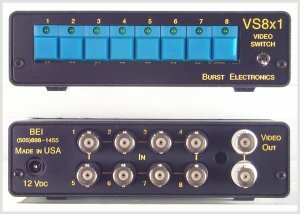 The VS8x1 is a eight input, dual output vertical interval video switcher. Specifications are the same as Model VS4x1. Second output to drive monitor, etc. Options: Rack mount, Model D keyboard remote (contact closure). The VS8x1R is RS232 controlled via PC. A proprietary cable/adapter interface is included to allow connection between the switcher and your PC - see adapter drawing. Any terminal emulator (i.e.. Windows HyperTerminal, ProComm) is all that is required to communicate with the switcher. The VS8x1RC uses the RC8x1 Remote Controller. A cabling kit and wiring diagram is included so the end-user/installer can create an interface of up to 25 feet. Red, Green and Orange colored filters are also included for the illuminated pushbuttons of the RC8x1. The RC8x1 is a remote control unit for the VS8x1RC. Illuminated switches with brightness control. The RC8x1 derives its power from the VS8x1RC.